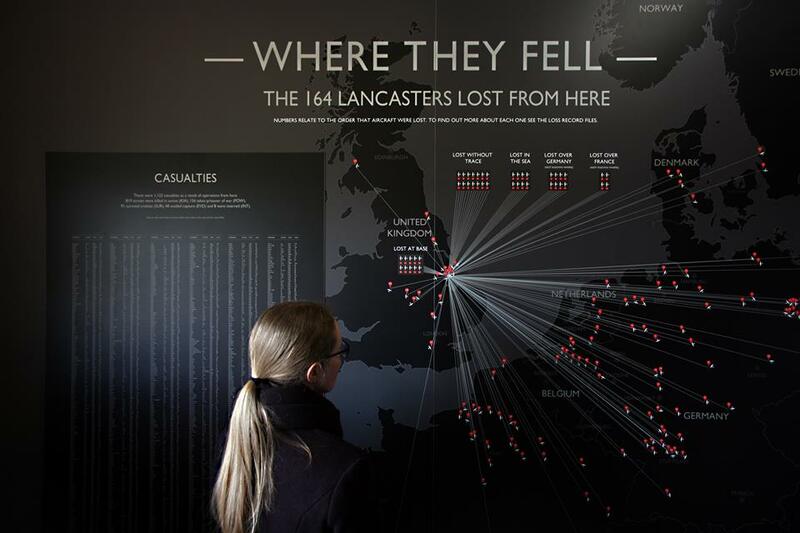 164 Lancaster bombers and thousands of airmen were lost from RAF East Kirkby in WW2. There’s now a museum at the airfield – The Lincolnshire Aviation Heritage Centre – dedicated to remembering those times. This exhibition maps all of the aircraft and people lost in action from this site. This is a story about tremendous effort and sacrifice at a dark time in history, where many airfields like this one acted as a fighting front in the Second World War. The exhibition acts as a visual system to encourage and help museum visitors experience the museums' extensive collection of archive material and artefacts that tell the story of these lost aircrews and their exploits. The display exists within the control tower which still stands at the airfield – from where all of this action happened.